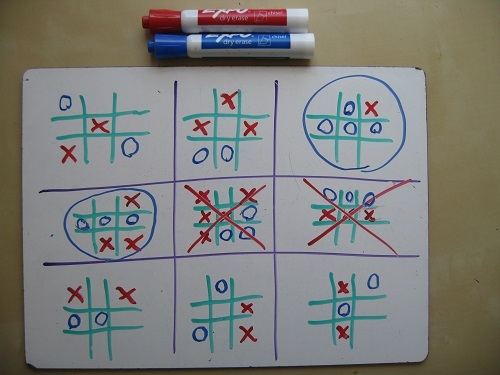 Once at a picnic, I saw mathematicians crowding around the last game I would have expected: Tic-tac-toe. As I watched, the basic rules emerged quickly. Each turn, you mark one of the small squares. When you get three in a row on a small board, you’ve won that board. To win the game, you need to win three small boards in a row. This lends the game a strategic element. You can’t just focus on the little board. You’ve got to consider where your move will send your opponent, and where his next move will send you, and so on. The resulting scenarios look bizarre. Players seem to move randomly, missing easy two- and three-in-a-rows. But there’s a method to the madness – they’re thinking ahead to future moves, wary of setting up their opponent on prime real estate. 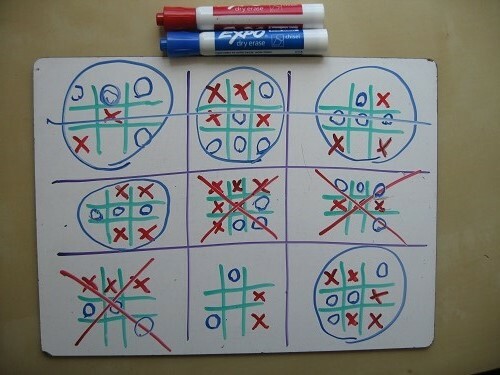 It is, in short, vastly more interesting than regular tic-tac-toe. 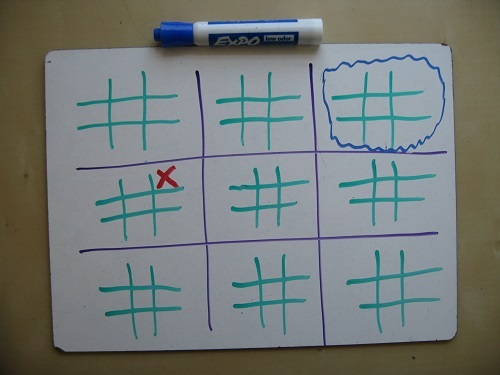 What if one of the small boards results in a tie? I recommend that the board counts for neither X nor O. 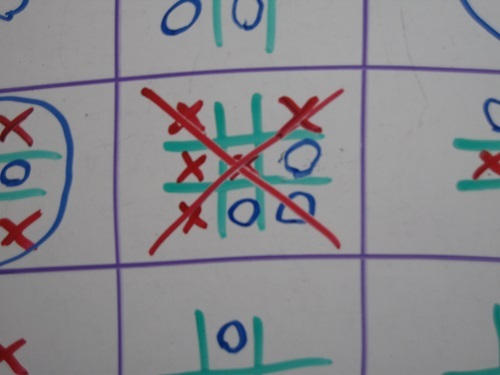 But, if you feel like a crazy variant, you could agree before the game to count a tied board for both X and O. 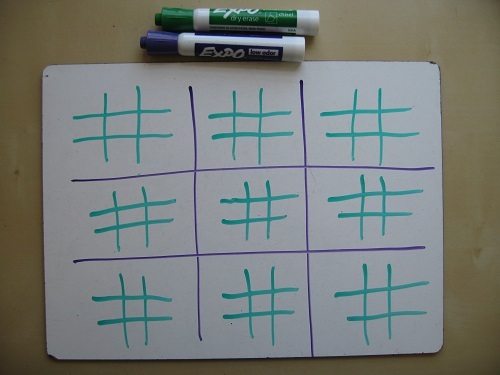 When I see my students playing tic-tac-toe, I resist the urge to roll my eyes, and I teach them this game instead. You could argue that it builds mathematical skills (deductive reasoning, conditional thinking, the geometric concept of similarity), but who cares? It’s a good game in any case. 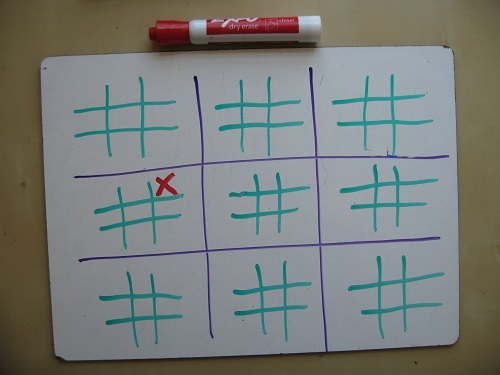 Anyway, that’s Ultimate Tic-Tac-Toe. Go play! Let me know how it goes! 11/18/13: See the follow-up post! While you’re here, check out Math Experts Split the Check and the epic rhyming proof-poem A Fight with Euclid. Someone showed me a cool variation. instead of eliminating boards that have been won from future play, you must still go on that board if forced. However, your move doesn’t affect the outcome of that board. 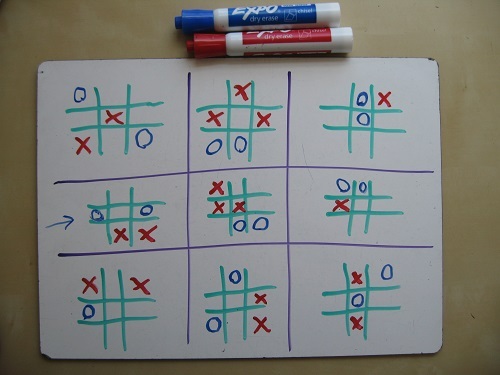 For example, if X wins one of the small boards, and then forces O to move on that board, instead of O getting to choose where to go, O still must go on that board. 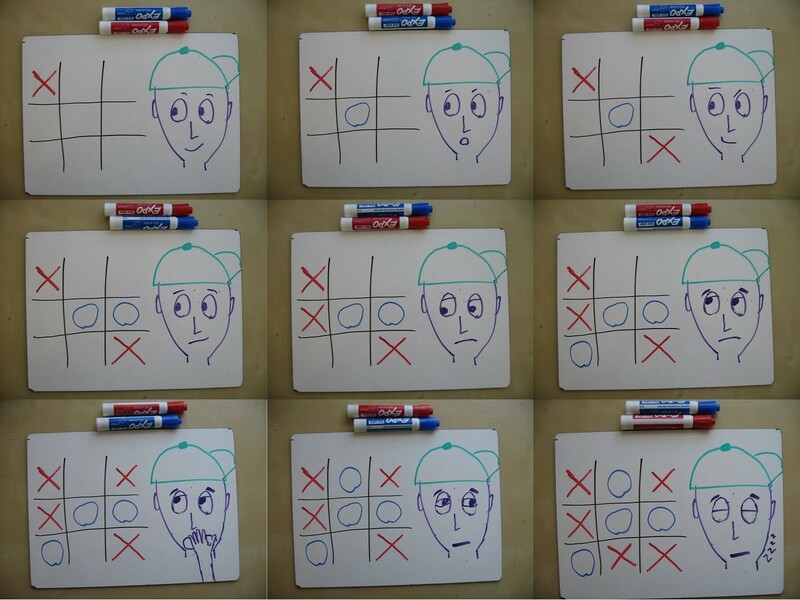 But no matter which move O makes, X remains the winner of that board. Be warned: this variation makes the game take much longer, and it makes winning the first board critical. The rule that if you get sent to a board which is already won, you get to choose a board was introduced to break this strategy. 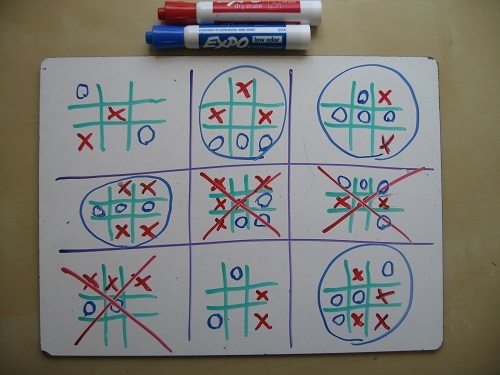 Check out this different variant on #TicTacToe!!! Here is another variant. Suppose a small board is a tie. Then it counts as a win for neither player… but only at first! Now next time someone is directed to play there they become the temporary winner of that board (instead of making a move). In other words, tied boards become wins for the last player to have been directed there. Ok, this is really cool! Let me know about new posts!